Ten years ago, on November 23, Shawn and I got together for a drink. We've been together since then. Shawn and I have known each other since we were kids. Our fathers are both Persian and were working in the same restaurant in DC. They both had American wives and I think when they met, I might have been about 3 or 4 and Shawn would have been 1 or 2. I don't remember anything from that time frame, really. When I was 5, we moved to the suburbs. Shawn's family followed a year or so later. From that time on, I remember holiday gatherings, birthdays and my mom and Shawn's mom hanging out and gossiping. Sadly though, Shawn and my younger brother Mike, had no interest in playing with the girl, so I was usually stuck either listening to the women gossip (ugh!) or taking care of my baby brother or playing by myself. Needless to say, there are a bunch of childhood memories that are great to rehash now as adults. 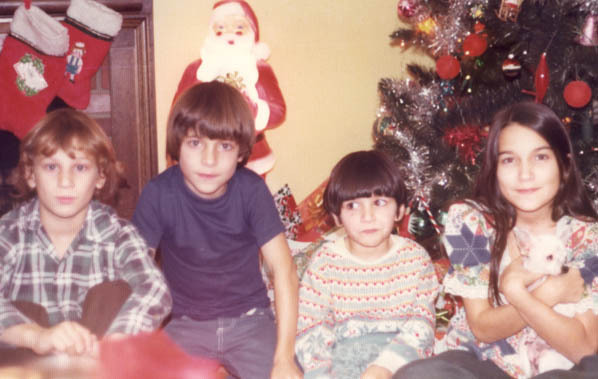 Here's a pic from Christmas, from 1974 or 1975. Shawn is on the far left, in between are my two brothers and I'm on the far right, with the Chihuahua. Somewhere along the line, when we were teenagers, our families lost touch. When my grandmother died in 1990, Shawn's mom was at her funeral. I was able to chat with Karen for a bit and she told me what Shawn had been up to. See flyer below. Shawn is on the far left. 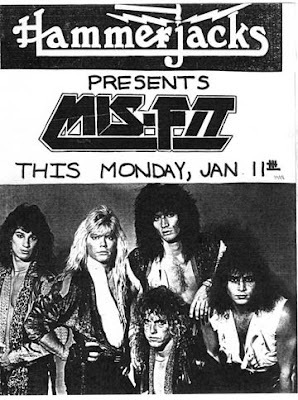 My roommate and I were always going to check out bands at Zaxx, Hammerjacks, The Bayou, The Rabbits Foot, etc... How had we NEVER heard of this band, especially since I knew one of the guys. Plus, Shawn was a hot, rockin' honey. So a few months go by and my roommates and some friends and I are at Zaxx in Springfield and I see Shawn there. Mind you he hasn't seen me since I was like 12 or so. So I go up to him and ask him if his name is Shahin Sharifi and sure enough it's him. We talk for a few minutes and that's it! I didn't give him my number because I didn't give my number out to band dudes. And he didn't give me his number because he was a hot, rockin' honey in a band and didn't give his number out to chicks. Eventually as fate would have it, I started dating someone and that relationship would end up being totally f'ed up. Shawn and I saw each other briefly, here and there, when I was broken up with the other dude, but clearly it was not our time and I simply wasn't in the right place to be with someone like Shawn. So, fast forward about 9 years, to 1999. I'm in college, have ended the f'ed up relationship once and for all and think it's time to look up an old friend and minimally apologize for being such a flake. So I emailed Shawn to say hi. That was in March. Never heard back. I emailed him again maybe in the summer (we've got all the emails saved:) and this time attached a photo of one of my paintings. Luckily I did that because the artwork inspired him to reply. Thank god for that painting!!! So we corresponded here and there and it was time for Thanksgiving break, so I was like how about we meet for a drink. He said sure ... we had that drink on November 23, 1999. The minute I saw his face, I knew that I would end up marrying him. It was just a weird premonition. I was only there to apologize for being a flake. My last semester of school, we visited back and forth. In March, I wrangled him into being my boyfriend:) I was visiting and he had a gig. So I asked him when people asked who I was what should I say, am I your girlfriend or what? He was like, yea, I guess you can say that. He proceeded to gleefully introduce me to everyone that night as his girlfriend. After I finished school, I moved back to northern VA. November 23, 2001, Shawn asked me to marry him. It was a total surprise. 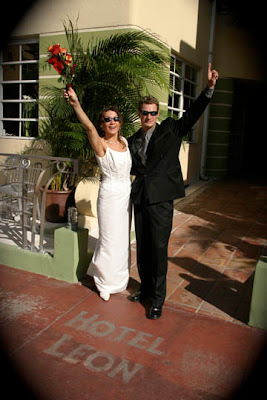 November 23, 2003 we got married. The best 10, 8 and 6 years of our lives. I can remember that Shawn called D-Street at Thanksgiving and was looking for you and I was like "um.....Shahin Sharifi is on the phone and want to speak to you?????" Poor little brother was the last to know.